Myron A. Waterman was a banking executive, writer, and cartoonist from Wellsville, New York, who moved to Kansas City, Kansas in the 1890s. 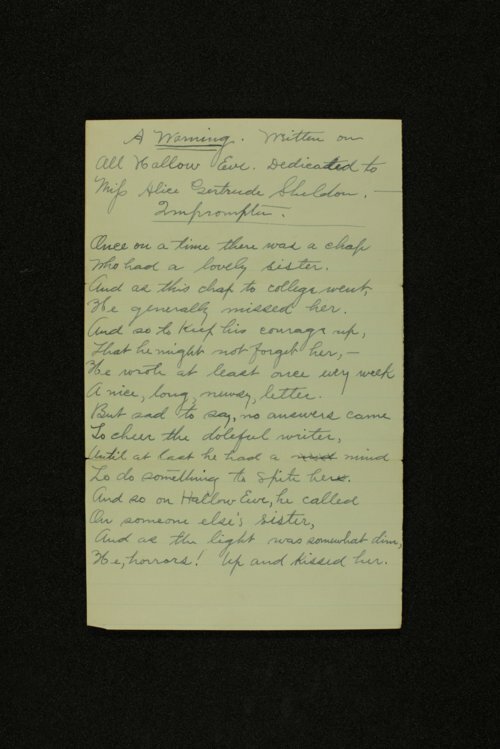 This collection of papers includes a short poem and two political cartoons by Waterman and a number of items penned by members of his wife Alice Gertrude Sheldon's family. There are poems and letters written by Aurilla Ward, Alice's grandmother. Aurilla also recorded the birth dates of her children on a page from a Bible and wrote her reflections on their baptisms, as evidenced by the presence of these items in the collection. There are also letters from other family members, a ledger that once belonged to Sarah Ward Sheldon, and several documents relating to Alice's father, Stuart Sheldon, and his trip to Valparaiso, Chile.